I remember my late father wished to bring me to Mandala Wangsit Siliwangi Museum when I was in high school. But despite we went to Bandung several times in a month, his wish never came true until he passed away 12 years ago. Then I don’t know it’s a coincidence or not, last September, my husband asked me to visit this museum before having fun in Floating Market. One reason why my husband brought Kiara and I to the museum, which located in Lembong Street (near Grand Royal Panghegar Hotel), is to prove that Mandala Wangsit Siliwangi Museum is not as eerie as we heard from many people on Internet. I, myself, just think that the one and only creepy museum in Bandung is The Postal Museum, because of its silence and hidden rooms. No public transportation passes in front of Mandala Wangsit Siliwangi Museum, so we must take angkot from Bandung Station Hall and stopped in Merdeka Street. The museum is built on 4,176 square meters and width of the building is 1,674 square meters. We found that this place consists of the museum, the office, and the official house. The museum itself is located at the back of the office. Traditional weapons of Indonesian Army and militia. The name Mandala Wangsit Siliwangi is taken from the name of Pajajaran Kingdom’s founder, Prabu (Sovereign) Siliwangi, which is also the name of Military Area Command in West Java. While “mandala wangsit” means a box to keep the message or advice from previous warrior to the next generation. The building was built in Netherland colonialization era in 1910-1915 as a homestay for Dutch officers. But then Indonesian Army took it back and changed it into the headquarters of Siliwangi Division in 1949-1950. On May 23, 1966, the Chief of Military Area Command, Colonel Ibrahim Adjie, inaugurated it as a museum. And on November 10, 1980, Major General Yoga Sugama re-inaugurated it as Mandala Wangsit Siliwangi Museum. No ticket to enter this military museum. But you are supposed to give donation voluntarily when you fill the guest book. We, for instance, gave 5,000 IDR. The money will be used to maintain the Mandala Wangsit Siliwangi Museum. Entering the museum, we saw the glass cupboards that show you the tradisional weapons such as bamboo spikes, kris, kujang, lance, and so on. There is also the painting of Prabu Siliwangi. Then we saw some pictures depict the arrival of the colonizer in Indonesia and the fight back act of local society, the photographs of the rebels, the clothes of the soldier, the flags of some Millitary District Commands under the Military Area Command Siliwangi, the table and cups used in Rengasdengklok meeting, etc. Rengasdengklok Table. On this table, the Independent Day of Indonesia was discussed. Yet, my husband and I don’t understand why people consider Mandala Wangsit Siliwangi as a spooky place. Because, we didn’t feel that. Not at all! However, I think it is because the rooms are humid, the lighting are dull, the dusty dioramas, some photos that show cruelty of rebellion, or the collection of army’s uniforms that spotted by blood. I think the management of Mandala Wangsit should vanish that eerie impression in order to increase the number of visitors. For example, by providing the friendly guides or officers in the museum, install the brighter lamps, and clean the museum regularly. 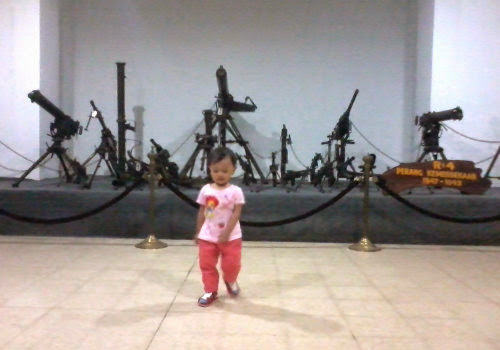 So people, even children, are willing to come to Mandala Wangsit Siliwangi Museum to grow their awareness about the fighting of the Indonesian soldiers and militias.